During the 18th Century when Jamaica prospered as a sugar colony, several large donations were made for the funding of schools. The objective of these bequests was usually to provide free education for the poor of the parish to which the benefactor belonged. 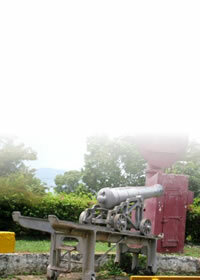 Jamaica College has its origin in a bequest of Charles Drax, a planter of the parish of St. Ann. Drax in his will dated 1721, left money to establish a charity school in St. Ann. 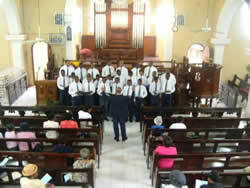 After much delay and legal proceedings, the money was handed over to the St. Ann Vestry. In 1802, the sum of £5200 was applied by an Act of the Legislature to the endowment of the School, which, since 1789, had been conducted by the Vestry of the parish by the Drax Free School. 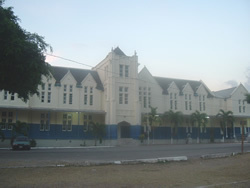 During the governorship of Sir Anthony Musgrave in 1879, provision was made by law for the Jamaica Free School, under a new name, the Jamaica High School, to come under the supervision of the Jamaica's School's Commission. This law also authorised the relocation of the School. Initially, the Barbican Great House in St. Andrew was rented for the School which was removed from St. Ann on February 1, 1883. 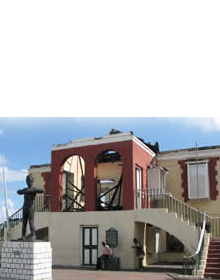 A site was eventually obtained at Hope, St. Andrew, where the School was reopened on July 9, 1885, by Sir Henry Norman, Governor of Jamaica. The first classes there took place in September of the same year. In September 1890, a College which was known as University College, was opened in connection with the school. 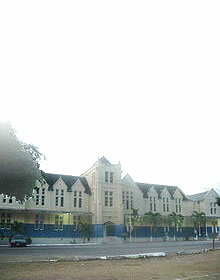 In 1902 a law was passed for the amalgamation of the Jamaica High School and the University College under the name of Jamaica College, by which it is still known. Simms Hall was built in 1885. It is of masonry and timber construction. The design of the building exhibits a combination of Gothic and Georgian features. The projecting central tower and wings are reminiscent of Georgian planning, however, the facade with its soaring verticals, griffins, and pointed arch openings, reflect typical Gothic characteristics. Simms Hall was originally used as a dormitory. At present, it houses the administrative offices, the staff room, and sixth form classrooms. The Assembly Hall was constructed in 1913. It is a concrete block and steel structure. The building is wrapped by an arcaded verandah which helps to keep the interior cool. The hipped roof which is covered with cedar shingles is partially concealed by parapet walls. This structure was originally used as an Assembly Hall, but it is presently houses classrooms. The Scotland Building was erected in 1889. It is made of brick, mortar, and wood, with iron detailing on the balcony railing. The use of the palladian window design on the west elevation, the lower arcaded wrap around verandah, and the steep pitched cedar shingled hip roof, indicate a combination of various architectural styles. The Scotland Building was first used as a dormitory, but it now houses classrooms. The Chapel was built in 1924. Its walls are constructed of reinforced concrete and concrete breather block. Along the north and south elevations a stepped roof creates a clerestory type level for ventilation and diffused lighting. The east and west windows of the building are stained glass. The west window is said to be a replica of St. Dustan's window at Canterbury Cathedral in England.